cosplay — The War Dolls - Girls Game Too! 1. I am currently wearing a pirate costume. 2. My Iron kingdoms rp group runs tonight, and thanks to time constraints I’ll have to wear my costume to Giga-bytes. 3. First post on the new WordPress site! I haven’t had the opportunity to game recently (other than my first 6e massacre game), nor paint, nor do much but work and worry with moving. However I have carried my sketchbook pretty much everywhere. 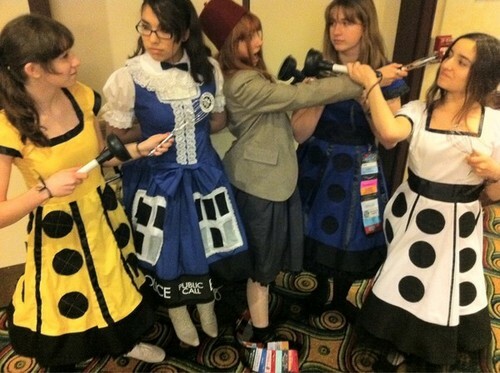 Lately I’ve been very enamoured with some of the girls’ Doctor Who costumes. (Uber nerd alert) I’ve gone and I’ve completed the preliminary design for my own ‘ultimate’ Doctor Who costume. I’m super excited about it as I’ve seen no one else with the same idea on the web, at least. Unfortunately, due to the move my sewing machine is still packed away in storage, so making it by Dragoncon this year was out of the question for certain. Currently my goal will be for Dragoncon 2013. Should be plenty of time. Of course there will perhaps be a twelfth Doctor by then, but hopefully that won’t be too much of a problem for me. Sketches will follow eventually, especially after my drawing skills improve!